Pushbutton panel for operating VETUS bow and stern thrusters. 'Sport' version without time delay feature. Watertight to IP66. The SCO 10 is a control and protection panel used for generating sets; it shows the settings measured on its displays. The unit is designed for easy use, for both installer and end-user alike. ON/OFF button always illuminate while controll buttons illuminates when switched on. Works with all windlasses and bow-stern thrusters that are + or - controlled. We offer a wide range of waterjet control systems for smooth and accurate boat-handling. Choose between single or twin levers or the full-featured joystick. Assessment and optimization of your consumptions. nke is offering a new battery monitor capable of answering the needs of more and more powerful on board alternators. It features a remote 500 A shunt. Boat control panels are electronic devices for the remote control of a variety of equipment and for setting parameters aboard the vessel. Those offered on NauticExpo are intended for recreational vessels rather than ships. 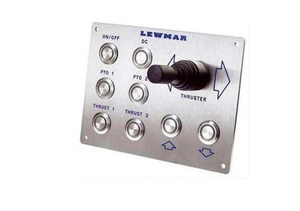 Such panels are used to control the windlass, thrusters, navigation lights, bilge alarms, sirens, windshield wipers, engines, hydraulic systems and numerous other pieces of equipment. Ship control panels are much more sophisticated to meet the professional needs of operating cranes, cargo loading systems, firefighting systems and similar equipment. These devices are often built in and designed to control specific devices. Some modern touchscreens incorporate controls for numerous functions. Certain panels are watertight or water-resistant for exterior installation. Choice will depend on the type, make and model of the equipment to be controlled. Verify that there is sufficient room on the dashboard, instrument console or planned place of installation. The panel's operating voltage must match that of the vessel.